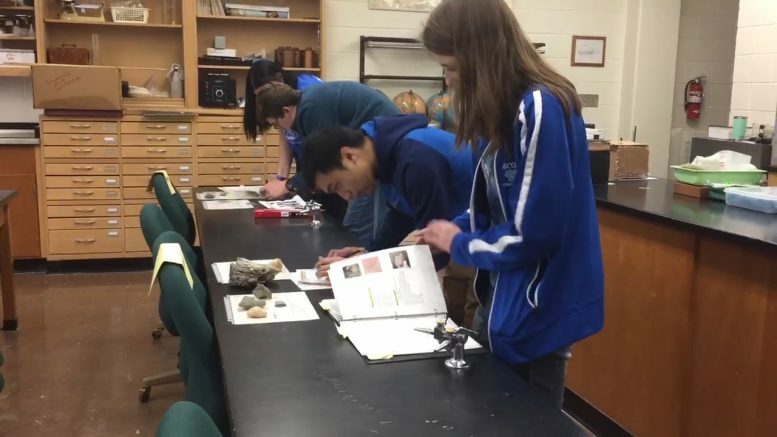 (Photo Courtesy/Melissa Doubek) Students identify fossils during a competition in the Science Olympiad. Alpena, Mich. — Some of the brightest young minds on the sunrise side put their skills to the test this afternoon at the Region 2 Science Olympiad. Junior High (Division B) and High School (Division C) students competed in all different types of science challenges to try and punch a ticket to state. Whether it was water quality, meteorology, or circuit lab, the goal was to end up with the least amount of points possible. Region 2 Director Deb Hautau knows that the competition is fun, but it’s the experience and challenges that inspire students to further their knowledge. With a full day of competition in the books, the future scientists had some fun before the final results were tallied. In Division B St. Ignatius in Rogers City and C.O.A.C. Homeschoolers advanced. In Division C, Mackinaw City and Alpena High School earned a ticket to state. 10 schools competed in today’s regional.